After encountering wildlife in its natural habitat or conquering the summit of Kilimanjaro, how can one discover the human dimension of Tanzania? There is no better way than to explore, preferably on foot, the foothills of Mount Kilimanjaro. Kilimanjaro is known worldwide for its permanent snowcap and a peak accessible to hardy adventurers willing to brave the cold and altitude, but it also hides many natural and cultural treasures. The band situated at 1400 – 2200 meters between the national park forest above and local villages below is a breathtaking landscape of unexpected lushness in sharp contrast to the wide African savanna. A rainforest encircles the mountain’s flanks and provides a diversity of vegetation, creating a complex tableau of rich greens across the slopes. 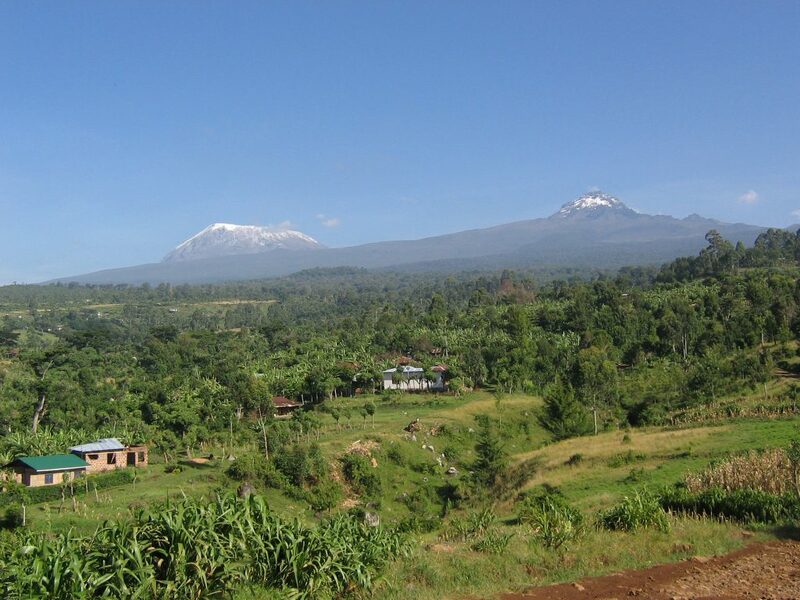 This area offers outstanding views of Moshi Town off the southern flank, the African savanna to the east and north, and majestic Mount Meru (Tanzania’s second highest mountain) to the west – all spectacular vistas easily enjoyed by the non-mountain climber. Numerous watercourses on all sides of the freestanding mountain carve dozens of valleys emanating from its flanks. Streams converge to rivers, sometimes spilling over in majestic waterfalls, or splitting into small channels hand-cut and maintained for centuries by local farmers for crop irrigation. Morning mists envelop the rainforest, creating a magical ambiance, and then dissipate as the intense tropical sun breaks through and warms the air. The sun also brings out kids to jump and play in the cool waterholes. 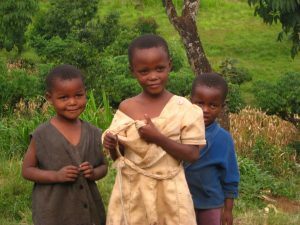 The ridges are the scene of local Chagga life on Kilimanjaro, while the deep valleys are crisscrossed by footpaths for people to access the homes, villages and fields that cling to the craggy slopes. Women walk the paths carrying on their heads large loads of sticks for the fire, grass to feed their cattle, or bananas for sale in the market. Children wearing brightly colored uniforms run to school. Around the homes, the younger children play with handmade toys within sight of their mothers or grandmothers. And the men… the men are often found sitting down in deep discussion amongst themselves, using the Chagga language (still widely spoken on the mountain for all local affairs). 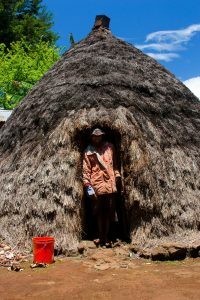 The original Chagga style homes were small huts (mmba in the Chagga language) built high and conical on the east side and low and arched on the west side. They had no walls. The roof was constructed of wooden sticks, with branches from thorny trees and thatch set down directly on the floor. The living space was shared with their domestic animals (goats, cows, etc.). Today these traditional huts have disappeared as people have moved into rectangular houses (nshelu, mtshalo or mshalo) made with bricks or cinder block, render and paint, with windows and a sheet metal roof. For privacy and security, houses are surrounded by natural hedges. Most houses have two courtyards – one for kids to play in and one at the back for sorting the grain and seeds. Here life continues unabated at a slow pace. THESE ARE THE SCENES FROM THE KILIMANJARO FOOTHILLS – A PLACE WHERE FEW TOURISTS VENTURE, WHICH CONTINUES TO BE AUTHENTIC TANZANIA, AND A MAGICAL PLACE TO EXPLORE AND DISCOVER.